The price is FOB Qingdao, China. For a majority of US states, shipping is typically (on average) around $990 for the first street light with 20' pole and around $100 to $150 for each subsequent sent in the same shipment. Container shipment is about $2,500 to $3,500, dependent the destination. Our shipping partner can take care of customs clearness for you. Once we receive your order, you will be supplied with a pro-forma invoice for your confirmation and you will be required to make payment against the pro-forma invoice. 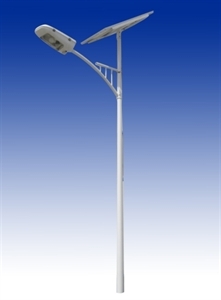 LED Light: unique multi-chip integrated single-mode high power group design with high-brightness chips, and life litme last over 50,000 hours, with protection grade IP65. LED lamp can save electricity more than 70% over high pressure sodium light. Shipping costs will vary and are subject to quantity, size and weight of shipment as well as delivery address. For a majority of US states, shipping is typically (on average) around $800 for one street light with 20' pole and around $100 for each subsequent street light with 20' pole sent at the same time to the same address. You can email us to request a shipping estimate once you are ready to place an order. Street light delivery times vary from 30-60 business days depending upon the delivery address and service. Customer arranged collection and freight collect services are not available. Air shipping is, naturally, not an option. All shipping costs provided are estimated only. Actual shipping costs are subject to size of order, delivery destination and type of shipping service required, therefore subject to change. Price shown is a trade, reseller, contractor and export price. For retail price, add 25% to prices shown. No discounts apply to quantities of 9 units or less. The 20' pole is a popular choice for most USA customers.